I was almost 60 when my doctor recommended a bone density exam. “It’s routine for women your age,” she told me. One lovely, sunny morning in September, I drove into Los Angeles for the exam. “This won’t take long,” the technician said. He directed me to a padded table before disappearing into his sealed-off control room. “Remember to lie still,” his voice crackled through a speaker. I heard a click as he turned off the mike and then the low rumbling of the detector arm as it passed over me once, from my shoulders to my knees, then returned to its initial spot, and began a second slow pass. “We’re detecting a large mass near your right kidney,” he said. And then, nonchalantly, he came into the room and told me I was free to leave. By the time I’d reached the parking lot and settled into my car, I was in a complete panic. Was it cancer? No, a bone scan wouldn’t pick up soft tissue, right? I turned on the ignition and headed home. But what was it? Nothing serious, I told myself, otherwise they would have kept me, called in a specialist, sent me to the ER. My imagination kicked into high gear just as I pulled onto the road. I could almost feel the mass growing, stabbing at my kidney as I rounded one curve and then the next, as I covered the familiar terrain of the Pasadena freeway. Concentrate on the road, I kept repeating. Concentrate and calm down. As I neared my exit, I’d come up with a plan to steady my nerves. I would do what women in my family have done for generations: I’d keep my hands busy. I’d knit a sweater. The next morning, I headed up to my favorite yarn store. My pace quickened as I climbed the few steps to the porch. I knew that once I opened the door I’d find a familiar comfort. I turned the doorknob and pushed, and then pushed again. Swollen with age and set into a wood-frame house that has rearranged itself countless times during California earthquakes, the door always sticks. But a final, more determined effort set the tiny bell ringing, and this prompted the owner to call out her greeting. “Oh, hi!” she said, “How are you?” Her cheery welcome bought her time to remember me. “Oh! It’s you! Let me show you our new yarn.” That’s when she had me. Now it was a matter of choosing one yarn over another, one pattern among many. I stopped worrying about spending hundreds of dollars on expensive yarn and I made plans to knit myself back to a manageable level of anxiety. “The red is very good with your color,” she said. I bought the red yarn and a pattern that featured a soaring collar. I could pull it up, I imagined, a protection against whatever health storm loomed. I nodded as I picked up the bag of yarn. But I knew speed wasn’t the goal. I wanted to lose myself in the slow monotony of knitting, slipping the needle into the stitch, throwing over a loop of yarn, making another stitch, and another, row after row. I’ve been knitting for so long, I can’t remember exactly when I started or who taught me. The needles were handed to me in childhood, like a bowl of oyster dressing passed at our Thanksgiving table, or the yearly ritual of decorating graves with peonies on Memorial Day. It was a transfer of family tradition. We knit and crochet. We coil baskets and braid rugs. We sew clothing, embroider handkerchiefs, and weave placemats. When I was little, I would return home from school to find my mother sitting on the living-room floor, adding yet another braided round to the rug that filled that room. At my grandmother’s house, the dining-room furniture was rearranged every winter to make room for her large quilting frames. They were set up in front of the south window to gather the light Grandma needed to place her tiny, even stitches – hundreds and hundreds of decorative stitches – through her handmade quilt tops, warm batting, and a fabric she chose for the backing. What I didn’t see being made, I heard about. At family gatherings, people liked to recall a day in the 1930s when Grandma left one of her quilt blocks on a streetcar in St. Joe, Missouri. It was during the Depression, and she and Grandpa didn’t have much money. But Grandma found a way to get fabric for a quilt that became her finest. After she had stepped from the streetcar with my young father in tow, she realized she’d left her sewing on the seat. She chased the streetcar and retrieved that one carefully and beautifully stitched quilt block. I like this picture of the women in my family using their handwork skills to help others. But in times of stress I turn to my projects for other reasons. I take comfort and pleasure in the feel of hand-spun yarn, with its hint of oil transferred from the coats of the sheep shorn for this wool. I hold a length of fine fabric and linger over the “hand,” or feel, of fibers perfectly woven into the fabric. I suspect I share these pleasures with the women of my family, as well as the deep need to retreat, if only temporarily, into a place of solitude where our minds sort through our concerns as we move knitting needles through yarn, row after row, or sewing needles over the fabric, stitch by stitch. I wouldn’t think to ask my female relatives if they share this experience. It’s too personal, too private, at least in the Midwestern culture I knew as a child. We watched and admired each other, even copied what we liked. But we didn’t ask questions about feelings. That’s why I was surprised to hear my Aunt Peg – my mother’s youngest sister – talk so emotionally about her work. Peg is a fiber artist. Her work ranges from conventionally woven placemats (which adorn my Thanksgiving table) to giant sculptures filling public stairwells. For a period she made baskets, wrapping waxed linen thread around threads of heavy hemp and then coiling this new fiber from one tiny circle at the base into forms that resembled baskets but then became something else. One summer, a gallery in Maine installed a solo exhibition of her baskets. Mother and I flew back for the opening, which featured an artist talk. We took our seats in the gallery, among a group of mostly women, some busy with their own knitting and sewing projects. As she walked from one basket to another, her five-foot frame hardly rising above the seated audience, I thought about times I watched her race around her house, responding to demands of her outspoken, opinionated husband, putting out squabbles between my cousins. Energy always defined my aunt. Peg lifted one basket high, and then another, explaining a technique or pointing to a distinctive shape. One basket – my favorite – was about fourteen inches in diameter. The coils occasionally pulled away from the body of the basket, creating an open, free-form shape that became even more fanciful with fragile, dried grape tendrils, which she had joined to the coils. Eachtime I see this object, I picture a giddy child twirling ribbons in wild abandon. It’s a great piece. I looked at Peg and recognized our shared legacy: we take the threads of sorrow and transform them, with our hands, into objects filled with beauty and emotion. We do it deliberately, privately, and find, in this solitary practice, a place to make sense of our lives. The red sweater was finished when my husband Michael and I met with a kidney specialist. The doctor rarely looked at us, instead staring at the x-ray on his computer screen. I knew what that meant: another sweater. Back at the yarn store, I considered a pattern for a sweater to be made from a bright yellow-green yarn. It was a simple pullover, edged in a cool blue that made the green even more vibrant. “Do you have this yarn?” I asked the owner. I read through the instructions and discovered, much to my disappointment, that it called for a crochet hook. No, I didn’t want the yarn. And I didn’t want to try something new. I was miserable from the waiting and terrified of the surgery that lay ahead. I drove home. When I opened the front door, I had a new urgent need. I wanted to find the old comforter, the one my grandmother made, the one I used when I needed just what it offered: comfort. I found it in my son’s room, rolled up in his closet. I hadn’t used it in years, and it needed a good wash. Once it was clean, I spread it out on my bed to look at it. This is part of the ritual of its use. The comforter has a story, which I always recall before I slip into the warmth of its worn folds. That story begins in Effingham, Kansas, a tiny farming community that Grandma called home. I was visiting her, probably on a break from college in the 1970s, when she opened her front door to find a box. She brought it into the living room, and, leaning forward in the overstuffed green armchair, lifted the top to discover what I’ll call an unwelcome gift. Her friend Rose had gathered up remnants of wildly patterned and roughly textured synthetic fabric from the dress factory where she worked. Grandma ran the fabric through her hands, as if she were testing different grades of sandpaper. My grandmother was hardly a snob about fabric, but she knew the feel of good cotton and sturdy wool, and these held no resemblance to those natural materials. Some pieces mocked knitting, with raised ribbing in red and white. Others put on airs, as Grandma would say, sporting shiny metallic threads woven into sad brown polyester. Yellow flowers bloomed incongruously on a field of gray jersey. Circles argued with chevrons, zigzagging lines laughed at dots, anchors floated on a sea of ugly blue. Nothing matched. Nothing made sense together. A piece of red fabric sported words from different languages in white: the German Ich for I, the French vous for you, a misspelled Pakastan, along with Arabic characters that meant nothing to my grandmother. I watched her puzzle out her alternatives on that fall afternoon. This was the time of year she “put in” a quilt on the sturdy old wooden frames she set up at the end of the dining room. There, for hours on end, she would decoratively stitch the layers together, catching the winter sun that fell through the south-facing window. She could make something of these remnants she now studied with disdain. But would she? “I suppose I shouldn’t let them go to waste,” she said. And that’s how my comforter began, the one she pieced together from scraps she didn’t really want. Her work has survived all these years, through many illnesses and just as many naps on long, cool afternoons. This is the comforter I planned to use during my convalescence. I imagined pulling the soft flannel side around my shoulders and draping myself in what I have learned from the women in my family. Life delivers its plans unexpectedly, and often in unwelcome ways. The morning Michael drove me to the hospital, I was ready to put the ordeal behind me. I was prepped on the gurney, an IV line hooked up for sedatives, and then disappeared through a maze of hospital doors leading to the operating room. By the time I got there, I had fallen into a deep sleep. Two hours later, I awoke in the recovery room to the touch of Michael’s hand. I looked up and saw a smile. “Good news, bad news!” he said. “You’re alive, but the surgery failed.” The procedure, called percutaneous nephrolithotripsy, had been billed as minimally invasive, using tiny instruments to enter the kidney, blow up the stone and vacuum the remains. The major concern, and the reason the surgeon had stopped after two hours of failed attempts, was blood loss. I came home and disappeared into the folds of the comforter. It became a shield, something to hide behind as I gained my strength and tamed my fury. We found another surgeon. He scheduled me for surgery a few months later, after I’d recovered from the blood loss. He must have had better equipment, or a better aim, because he blew up the stone in short order. I was up and walking within hours of that procedure. I came home the next morning. One of the first things I did was fold up Grandma’s comforter. I knew I’d need it another day, but for now, finally, the anxiety had passed. I put away my knitting needles, too, but not for long. That first week I was home, I found a box on my front porch. The return address was Aunt Peg’s. I opened the box and found skeins of multicolored cotton yarn and an impossibly difficult pattern for a vest. I studied it, tried a few samples, and nearly gave up. I think of her comment every time I wear that vest. And every time I slip under Grandma’s comforter. We make sense of surprises by taking them in hand. Author’s Comment: I have family textiles I treasure, each one holding the story of who made it. Mostly I store them, keeping them away from everyday wear and tear. But the comforter that inspired this story, a comforter my grandmother pieced together from scraps, is the one I pull out when I don’t feel well. I even let my dogs join me as I nap under its warmth, drawing comfort from the memories of my grandmother and the many women in my family who made beautiful and useful textiles, and taught me to do the same. 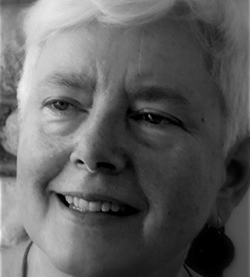 Susan Hoffmann lives in South Pasadena, California, where she writes personal essays inspired by her family. She has retired from a long career in art museum education, having written educational materials and taught classes for the Los Angeles County Museum of Art. She also wrote promotional materials for the California Institute of Technology and the Art Center College of Design, where she taught courses on modern art. Hoffmann’s work has been published by Literary Mama, Gravel, and 500 Pens, a social justice news project. An essay inspired by her son’s disability, “A Boy Like Mine”, was a finalist in the Tenth Glass Woman Prize. Hoffmann recently launched a blog inspired by letters her grandfather wrote home 100 years ago, during his service in World War 1: ww1betweenthelines.com. View More: Next piece "Falling", Home, Archive. A lovely story, gentle, poignant, heartwarming. And though two lap warmers I knit were simply for warmth on nights when my husband & I watched TV, the sweater I more recently knit, saw me through many nights of sitting at his bedside, afraid to stay & afraid to go. (Interestingly enough, I didn’t like it when it was finished –and my husband had just died. (Guess Freud would have something to say about that–)-I like your beautifully told story and your memories better. Thank you..
Stitching brings so much comfort, and binds us together in a sisterhood that is both freeing and compassionate. We chuckle over our “addictions”, but overlying it is the understanding that we are truly bound to each other and to the women who both preceded us and proceed from us by the work of our hands. Thank you for this reminder of the preciousness of the gifts of our “mothers”, both in items we can wrap up in, and in skills that we can use to bring joy and comfort to ourselves and to those around us. great message in this for how to face ordeals, terrors, the unknown — the scary surprises. The editor of this magazine turned me on to needlepoint and I’ve been using it this way ever since. also love remembering learning to knit, and later to embroider, from my warm, loveable, saftig grandmother — the dress-making was done with my skinny little martinet of a grandmother who made it terrifying — what a difference it makes, how we learn, and how we feel about it later — Love your family culture of handwork and textiles and creativity! As an obsessive stitcher since 7th grade, I relate completely. I know we are not alone in taking comfort from hand work. My mom worked at the Horton Garment Factory in Atchison the late 1960’s and till it closed as a secretary.. She also bought extra material and made dresses for herself and us. I have a quilt she made for me when I went away to nursing school for my bed. The material you described I know! LOL I do hand work–mostly cross stitch and find a lot of comfort in stitching. Stitching is a great comfort! I enjoyed your piece very much and have shared it with the Kansas Stitchers group I belong to on Facebook. My grandmother would be so happy to know we’ve made this connection, sisters in stitches! She loved Effingham and all her friends there. Lovely, lovely piece! It rings true for many hands.